He said to them, "Why are you terrified, O you of little faith?" Just as Jesus prays to the Father and gives thanks before receiving his gifts, so he teaches us filial boldness: "Whatever you ask in prayer, believe that you receive it, and you will." Such is the power of prayer and of faith that does not doubt: "all things are possible to him who believes." Jesus is as saddened by the "lack of faith" of his own neighbors and the "little faith" of his own disciples as he is struck with admiration at the great faith of the Roman centurion and the Canaanite woman. Celebrating the Sacerdotal Year: this image of Christ the High Priest is recommended by the US Bishops for the Celebration of the Sacerdotal Year. More information may be found by clicking on this link. Note to readers: Daily postings may be later than the usual 1:00 AM Eastern Time due to Blogspot technical difficulties. Thank you for your visit today. 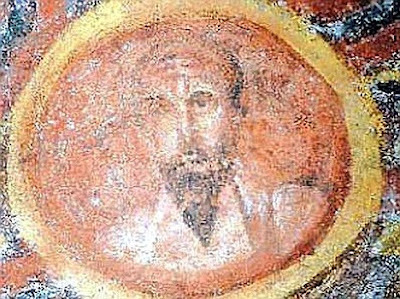 Oldest image of Saint Paul discovered in Rome: "I, Paul, am ... being poured out"
I, Paul, am already being poured out like a libation, and the time of my departure is at hand. I have competed well; I have finished the race; I have kept the faith. "Do not be afraid, just have Faith." The greatest disease or suffering, the greatest privation for the human person, is to live without faith. In the Gospel the Lord exercises His power as God to reverse the course of nature and to restore life and health to those suffering sickness in body. As wonderful as these stories of miraculous healing may be, as much as we delight to hear them retold in our Mass this morning and to imagine the wonder and joy of those who saw and experienced the Divine power of Christ the healer, there is yet something more we need to have. We need Faith. Disease and death have power over us because they can cause us to be fearful. Fear takes away the goodness and joy of living; fear takes away our hope. The only power that can restore hope and joy is Faith – the grace of a God that who opens a future for us despite the existence of disease, suffering and death in this world. Faith opens up a way of trust and hope because it reveals for us that disease, suffering and death will not have the last word for us and for those we love. This is the reason why Christ says “Do not be afraid, just have Faith.” Christ gives a command in the Gospel this morning that we do not find surprising because we have heard him say it before, he tells us, “Do not be afraid, just have faith.” Have you ever wanted to tell someone who says this, “Easy for you to say.” We are tempted to respond in this way when we think that the person who is speaking to us cannot share in or understand our condition. Are you tempted to think you might have said this, or wanted to say this, to Christ if you had been there that day to witness the events we hear about in the Gospel? “Just have faith”: little words that demand great things. But was it “easy” for Christ to say this? No, it was not. Christ in his human nature experienced everything that we experience except for sin. This means that Christ the God-man needed to have Faith in his Father in the same way as He asks us to exercise this virtue. Christ teaches us with compassion that comes from fully sharing in our human condition as well as from His divine authority as God. “Do not be afraid, just have faith.” Christ can say these words in a truly compassionate and loving way because He does not say them merely with authority. He is not only the Teacher, the one who shares the truth about Faith with us. No, what is more, He Himself is Faith, the source of Faith for all of us whom He invites today to live a new kind of life, a different kind of life, a life without fear. What does it mean to “have Faith?” It means to “have Christ”; to “love” Christ. Christ invites us to possess Him, and in having Him, having also the antidote to the temptation of fear. There are other diseases we do not hear about in the Gospel today: the fear brought by poverty, the fear of loneliness and of old age; the fear of what the future might bring; the fear of losing one’s job or one’s home. For a priest the promise to obey his bishop and to go wherever he is sent to serve God’s people might bring a temptation to be fearful. All of these fears rob life of joy because they steal our hope. We are invited today to possess the One who opens the way to hope as we move toward the future: Jesus Christ, who alone can promise to love us no matter what we look like, or where we live, or how much money we make. Jesus Christ fully shares our human nature so that we can share in His Divine life which never ends and which alone is victorious over all that threatens to rob us of hope in this world which is so very temporary, whether disease or suffering or death. Christ invites us to possess Him, to open our lives to the treasure of His love. He also gives us the means of doing so: to sincerely open ourselves to His Word in the sacred Scriptures and to receive Him with Faith and love as He gives Himself to us, truly present in the Eucharist. Let us dedicate ourselves with fervent joy to these works of love, doing in this way exactly as the Lord invites us today, “Do not be afraid, just have Faith." 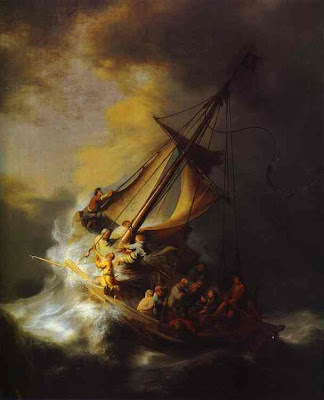 THIRTEENTH Sunday in Ordinary Time: "Do not be afraid; just have faith." 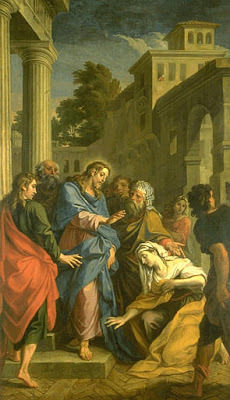 Jesus' raising the dead to life was remarkable, and his healing of the woman afflicted with a hemorrhage was remarkable, but the prophets had also healed the sick, the blind and the lame and the prophets had also raised the dead. These raisings and healings were a return to, or restoration of, mere earthly existence. There is more! There is something more offered to us in Jesus that sets him completely apart as the Christ. These miraculous events portend the same reality, whether coming through the prophets or Christ: eternal life. Our resurrection will be possible only in and with the divine person of Jesus Christ. We must be in bodily union with him if we wish to be raised as he was from the dead to the glorified state of resurrection. "He cured all the sick"
"Lord ... you can make me clean." Very often in the Gospels people address Jesus as "Lord". This title testifies to the respect and trust of those who approach him for help and healing. At the prompting of the Holy Spirit, "Lord" expresses the recognition of the divine mystery of Jesus. In the encounter with the risen Jesus, this title becomes adoration: "My Lord and my God!" It thus takes on a connotation of love and affection that remains proper to the Christian tradition: "It is the Lord!" "Not everyone who says 'Lord, Lord' will enter the kingdom of heaven"
The prayer of faith consists not only in saying "Lord, Lord," but in disposing the heart to do the will of the Father. Jesus calls his disciples to bring into their prayer this concern for cooperating with the divine plan. By prayer we can discern "what is the will of God" and obtain the endurance to do it. Jesus teaches us that one enters the kingdom of heaven not by speaking words, but by doing "the will of my Father in heaven." "How narrow the gate and constricted the road that leads to life. Following in the steps of the prophets and John the Baptist, Jesus announced the judgment of the Last Day in his preaching. Then will the conduct of each one and the secrets of hearts be brought to light. Then will the culpable unbelief that counted the offer of God's grace as nothing be condemned. Our attitude to our neighbor will disclose acceptance or refusal of grace and divine love. On the Last Day Jesus will say: "Truly I say to you, as you did it to one of the least of these my brethren, you did it to me." TWELFTH Sunday in Ordinary Time: "Teacher, do you not care if we perish?" "Teacher, do you not care if we perish?" Storms or no storms, in tempest and in peace, we must live by faith. The greatest test of faith is the confidence of belief in God through the fear brought by the terrors of darkness and the tempests of temptation. Faith is given by God precisely to sustain our weakness by divine power through the difficulties life will bring. "Perfect faith casts out all fear." 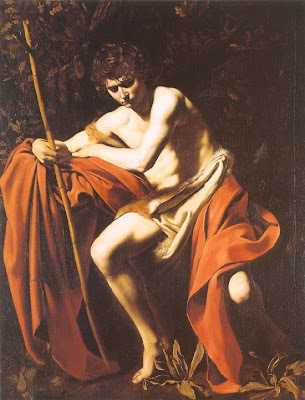 The saints and martyrs, the witnesses, including the Apostles who feared the storm and the seas, are the ones to whom we look to learn how to be men and women of faith, even while enduring the temptations and doubts that flesh is heir to. "Prayer is a vital necessity. Proof from the contrary is no less convincing: if we do not allow the Spirit to lead us, we fall back into the slavery of sin. (Cf. Galatians 5:16-25) How can the Holy Spirit be our life if our heart is far from him? The best antidote to fear is the heart at prayer, confident of the mercy of God and the nearness of salvation in the sacramental life. Tanti auguri, Archbishop-elect Augustine Di Noia, O.P. "I think the liturgy should give us a sense of the heavenly liturgy; it's about God, not us," DiNoia said. Looking at liturgy today, Archbishop-designate DiNoia said, "The great danger is when the focus is on the celebrating community" rather than on God. Many best wishes. Tanti auguri! For more information, please visit The New Liturgical Movement. St. Paul: "for when I am weak, then I am strong." but I will go on to visions and revelations of the Lord. was caught up to the third heaven. which no one may utter. but about myself I will not boast, except about my weaknesses. for I would be telling the truth. because of the abundance of the revelations. Saint Paul: "Please put up with me." If only you would put up with a little foolishness from me! Please put up with me. to present you as a chaste virgin to Christ. from a sincere and pure commitment to Christ. you put up with it well enough. By his virginal conception, Jesus, the New Adam, ushers in the new birth of children adopted in the Holy Spirit through faith. "How can this be?" Participation in the divine life arises "not of blood nor of the will of the flesh nor of the will of man, but of God". The acceptance of this life is virginal because it is entirely the Spirit's gift to man. The spousal character of the human vocation in relation to God (Cf. 2 Cor 11:2) is fulfilled perfectly in Mary's virginal motherhood. "God loves a cheerful giver." which through us produces thanksgiving to God. The fruits of the Spirit are perfections that the Holy Spirit forms in us as the first fruits of eternal glory. The tradition of the Church lists twelve of them: "charity, joy, peace, patience, kindness, goodness, generosity, gentleness, faithfulness, modesty, self-control, chastity." "Joy and poverty overflowed in a wealth of generosity"
overflowed in a wealth of generosity on their part. he should also complete for you this gracious act also. by your concern for others. In economic matters, respect for human dignity requires the practice of the virtue of temperance, so as to moderate attachment to this world's goods; the practice of the virtue of justice, to preserve our neighbor's rights and render him what is his due; and the practice of solidarity, in accordance with the golden rule and in keeping with the generosity of the Lord, who "though he was rich, yet for your sake . . . became poor so that by his poverty, you might become rich." NOTA BENE: The world bombards the Christian, already rich, with the lie that he is poor. "You need this, you need that; you need to look like this and you need to live here or there." Lies from the Father of Lies. You are already rich, and you will become richer when you share the treasure of Christ with the poor: those without love, without peace. "Do not receive the grace of God in vain." not to receive the grace of God in vain. The message of the Last Judgment calls men to conversion while God is still giving them "the acceptable time, . . . the day of salvation." It inspires a holy fear of God and commits them to the justice of the Kingdom of God. It proclaims the "blessed hope" of the Lord's return, when he will come "to be glorified in his saints, and to be marveled at in all who have believed." Someone is attacking you, not by striking on your cheek, but rather behind your back through calumny or detraction? Then "offer no resistance to one who is evil" -- do not respond by committing the same sin, by repeating the faults of your enemy or spreading untruths, for this would only be "An eye for an eye and a tooth for a tooth." No, "do not to receive the grace of God in vain". Open not your mouth but, rather, your heart and "pray for your persecutor" offering "no resistance" by "turning the other cheek". Upon this Cross is your foretaste of glorious resurrection! but for him who for their sake died and was raised. It is love "to the end" that confers on Christ's sacrifice its value as redemption and reparation, as atonement and satisfaction. He knew and loved us all when he offered his life. Now "the love of Christ controls us, because we are convinced that one has died for all; therefore all have died." No man, not even the holiest, was ever able to take on himself the sins of all men and offer himself as a sacrifice for all. The existence in Christ of the divine person of the Son, who at once surpasses and embraces all human persons, and constitutes himself as the Head of all mankind, makes possible his redemptive sacrifice for all. "We hold this treasure in earthen vessels,"
Through the sacraments of Christian initiation, man receives the new life of Christ. Now we carry this life "in earthen vessels," and it remains "hidden with Christ in God." We are still in our "earthly tent," subject to suffering, illness, and death. This new life as a child of God can be weakened and even lost by sin. "Such confidence we have through Christ toward God." not of letter but of spirit; for the letter brings death, but the Spirit gives life. Jesus unites them to the mission he received from the Father. As "the Son can do nothing of his own accord," but receives everything from the Father who sent him, so those whom Jesus sends can do nothing apart from him, from whom they received both the mandate for their mission and the power to carry it out. Christ's apostles knew that they were called by God as "ministers of a new covenant," "servants of God," "ambassadors for Christ," "servants of Christ and stewards of the mysteries of God." "God has put His seal upon us"
The Holy Spirit has marked us with the seal of the Lord ("Dominicus character") "for the day of redemption." "Baptism indeed is the seal of eternal life." The faithful Christian who has "kept the seal" until the end, remaining faithful to the demands of his Baptism, will be able to depart this life "marked with the sign of faith," with his baptismal faith, in expectation of the blessed vision of God - the consummation of faith - and in the hope of resurrection. "Paul, an Apostle of Christ Jesus"
As in the prayer of petition, every event and need can become an offering of thanksgiving. The letters of St. Paul often begin and end with thanksgiving, and the Lord Jesus is always present in it: "Give thanks in all circumstances; for this is the will of God in Christ Jesus for you"; "Continue steadfastly in prayer, being watchful in it with thanksgiving." Saint Paul: "You received a Spirit of adoption." For those who are led by the Spirit of God are sons of God. through whom we cry, "Abba, Father!" Filial adoption, in making us partakers by grace in the divine nature, can bestow true merit on us as a result of God's gratuitous justice. This is our right by grace, the full right of love, making us "co-heirs" with Christ and worthy of obtaining "the promised inheritance of eternal life." The merits of our good works are gifts of the divine goodness. "Grace has gone before us; now we are given what is due. . . . Our merits are God's gifts." "Give God the praise and glory"
Certain constant characteristics appear throughout the Psalms: simplicity and spontaneity of prayer; the desire for God himself through and with all that is good in his creation; the distraught situation of the believer who, in his preferential love for the Lord, is exposed to a host of enemies and temptations, but who waits upon what the faithful God will do, in the certitude of his love and in submission to his will. The prayer of the psalms is always sustained by praise; that is why the title of this collection as handed down to us is so fitting: "The Praises." Collected for the assembly's worship, the Psalter both sounds the call to prayer and sings the response to that call: Hallelu-Yah! ("Alleluia"), "Praise the Lord!" What is more pleasing than a psalm? David expresses it well: "Praise the Lord, for a psalm is good: let there be praise of our God with gladness and grace!" Yes, a psalm is a blessing on the lips of the people, praise of God, the assembly's homage, a general acclamation, a word that speaks for all, the voice of the Church, a confession of faith in song. "David himself calls him 'lord' "
"...so how is he his son?" Many Jews and even certain Gentiles who shared their hope recognized in Jesus the fundamental attributes of the messianic "Son of David", promised by God to Israel. Jesus accepted his rightful title of Messiah, though with some reserve because it was understood by some of his contemporaries in too human a sense, as essentially political. "How do the scribes claim that the Christ is the son of David? so how is he his son?" Anointing. The symbolism of anointing with oil also signifies the Holy Spirit, to the point of becoming a synonym for the Holy Spirit. In Christian initiation, anointing is the sacramental sign of Confirmation, called "chrismation" in the Churches of the East. Its full force can be grasped only in relation to the primary anointing accomplished by the Holy Spirit, that of Jesus. Christ (in Hebrew "messiah") means the one "anointed" by God's Spirit. There were several anointed ones of the Lord in the Old Covenant, pre-eminently King David. But Jesus is God's Anointed in a unique way: the humanity the Son assumed was entirely anointed by the Holy Spirit. The Holy Spirit established him as "Christ." The Virgin Mary conceived Christ by the Holy Spirit who, through the angel, proclaimed him the Christ at his birth, and prompted Simeon to come to the temple to see the Christ of the Lord. The Spirit filled Christ and the power of the Spirit went out from him in his acts of healing and of saving. Finally, it was the Spirit who raised Jesus from the dead. Now, fully established as "Christ" in his humanity victorious over death, Jesus pours out the Holy Spirit abundantly until "the saints" constitute - in their union with the humanity of the Son of God - that perfect man "to the measure of the stature of the fullness of Christ": "the whole Christ," in St. Augustine's expression. In response to the question about the first of the commandments, Jesus says: "The first is, 'Hear, O Israel: The Lord our God, the Lord is one; and you shall love the Lord your God with all your heart, and with all your soul, and with all your mind, and with all your strength.' The second is this, 'You shall love your neighbor as yourself.' There is no other commandment greater than these." The apostle St. Paul reminds us of this: "He who loves his neighbor has fulfilled the law. The commandments, 'You shall not commit adultery, You shall not kill, You shall not steal, You shall not covet,' and any other commandment, are summed up in this sentence, 'You shall love your neighbor as yourself.' Love does no wrong to a neighbor; therefore love is the fulfilling of the law." "Hear, O Israel, the LORD our God is one LORD..." (Dt 6:4; Mk 12:29). "The supreme being must be unique, without equal. . . If God is not one, he is not God" (Tertullian, Adv. Marc., 1, 3, 5: PL 2, 274). "He is the God of the living"
The Pharisees and many of the Lord's contemporaries hoped for the resurrection. Jesus teaches it firmly. To the Sadducees who deny it he answers, "Is not this why you are wrong, that you know neither the scriptures nor the power of God?" Faith in the resurrection rests on faith in God who "is not God of the dead, but of the living." From the beginning of Christian history, the assertion of Christ's lordship over the world and over history has implicitly recognized that man should not submit his personal freedom in an absolute manner to any earthly power, but only to God the Father and the Lord Jesus Christ: Caesar is not "the Lord". "The Church. . . believes that the key, the center and the purpose of the whole of man's history is to be found in its Lord and Master." "Proclaim the death of the Lord until He comes"
But those tenants said to one another, 'This is the heir. For as often as we eat this bread and drink the cup, we proclaim the death of the Lord. If we proclaim the Lord's death, we proclaim the forgiveness of sins. If, as often as his blood is poured out, it is poured for the forgiveness of sins, I should always receive it, so that it may always forgive my sins. Because I always sin, I should always have a remedy.